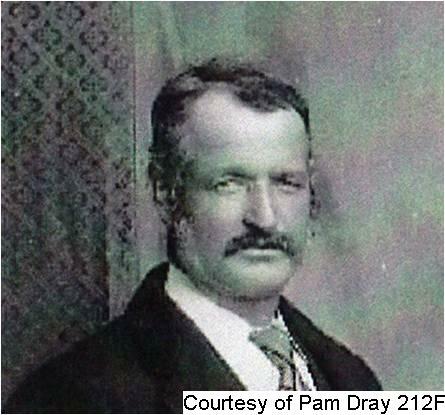 The Dray Family during WW1, told by Pam Dray. This is the story of the Dray family. James Edward Dray and Elizabeth Cloake had 1 daughter, 4 Sons and one Step Son. Included in the following information are details about the family and their service to The Great War. James Dray 1854-1925 (Son of James Edward Dray and Elizabeth Cloake) and his wife Ellen Sophie Nee Hawkins of 1, Albert Lane, Hythe, Kent. James and Ellen had 15 children with 11 sons and 4 daughters and how proud these parents must have been to have so many sons serving their country during world war one. One mention in the local paper praising them having 7 sons at war (an 8th son followed his brothers in 1916.) 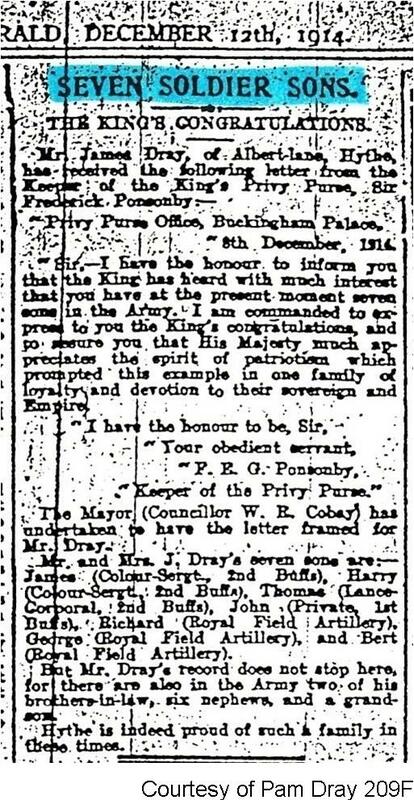 Then they received a letter from the keeper of the Kings Privy purse Sir Frederick Ponsonby dated 8th December 1914. One was in the Sandgate and Cheriton Herald and second in the Hythe Reporter December 1914. James had lead an interesting life as he enlisted 3/01/1896 and previously served in 1st Volunteer Battalion, Buffs. He ended up with the rank of regimental Sergeant Major. Germany transferred to Royal West Surrey Regt 1919-1920, Army of Occupation. James was discharged in 1920 to Chronic Rheumatism due to war service. He did a Military Engineering course in Chatham 1899, a Cookery course, Aldershot 1899 and a Master Cooks course, Aldershot 1903. Thomas was born in 1892 and was the only son not to return home. He was commemorated on his local war memorial in Prospect Road, Hythe, Kent and at his school St Leonards. 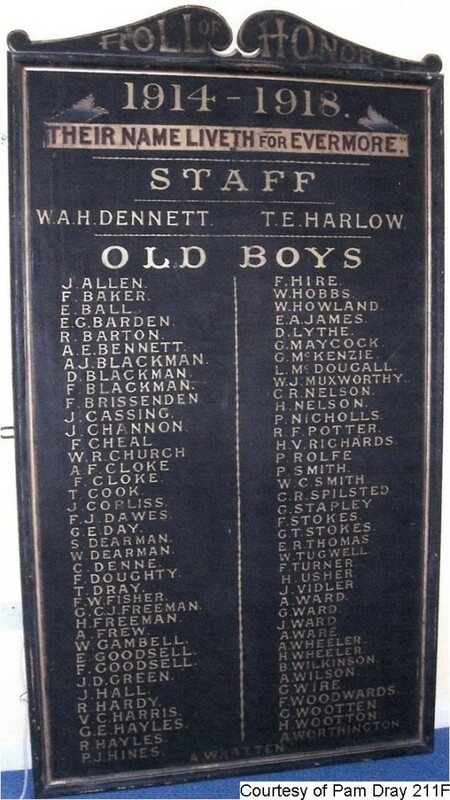 The other Sons of James and Ellen Dray I haven’t got photos or much information about but feel they must be included. Edward Dray was born 24/11/1874 and married Bertha Annie Chester in 1895. Edward died 21/4/1954. George Dray, born 1879, Hythe, Kent, was in the Royal Field Artillery. John Dray was born on the 26.3.1881 in Hythe, Kent. He was a Private in the 1st Buffs. 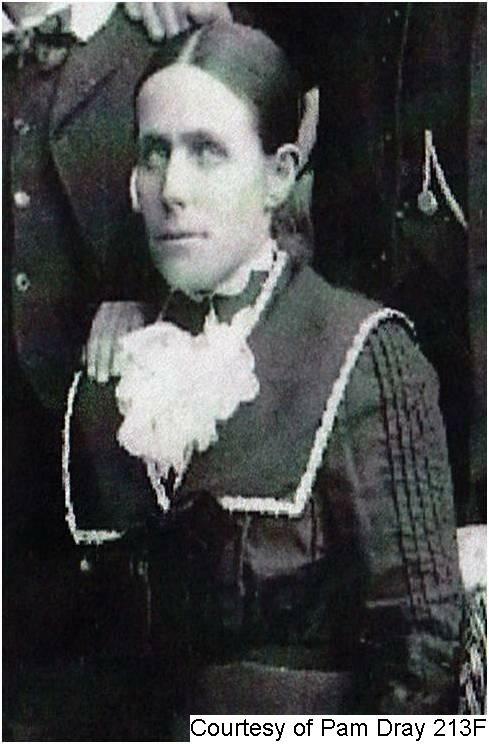 Sarah Ann Dray, born 1882 in Hythe, died 1884 in Hythe. William Frederick Dray, born 1884 - 1960 as yet no record found of war service or exemption. Percy Charles Dray, born 24.11.1886 Hythe Kent. On the 25th March 1916 it was reported in the local paper that Percy had asked for an exemption not to join the army, on account of he was the last single son at home and although working as a Labourer at the Camp he was also helping his father in his fish and chip shop of evenings also running the accounts. Capt Twopenny said that whilst recognising the splendid record of the family, Dray, being away all day, could hardly be indispensable to his father’s business. The Mayor then said he appreciated the grand example the family had set, and therefore he granted a month’s extension, with the following two months. I think there was also a twist to this tale as on the 16.4.1916 the last banns for his wedding to Mable May Browne were called and were married after that. I am not sure but it was believed he did go into the army at a later date. Harry Dray, born 8.8.1886, Hythe, Kent, Number l/7966 2/East Kent. He made the Army his career and finished as a Colour Sergeant in the Buffs. He married Minnette De Silva in Bangalore India in 1919 and remained out there for the rest of his life. Harry was issued with the British War Medal in India 10.9.1923 in Madras being a Regimental Quartermaster Sergeant at that time. It is believed Harry stayed in India and died there. Helen Sophie Dray was born in 1893 in Hythe. Richard Dray, born 2/5/1894, Hythe, Kent, 855431 DVR 64 Bde Royal Field Artillery. Fleetwood George Dray born 18.8.1895 Hythe Kent Number 14675 R.F.A of Hythe was 19 years 7 months when he enlisted in Dover in 1914 as a driver. His occupation at the time was a Hotel Worker. From his service records he went to France and whilst there he was awaiting trial 16.5.1917 but sentence was commuted to 24.12.1918 remainder of sentence 2 years I.H.L. 21.5.1917 and the sentence would be brought forward for reconsideration in September 1918. What was his crime? We did not find out. In his records was a letter from his father to the records office of the R.F.A in Oct 1917, saying he had not heard from his son in 6 months and wanted to know if he was ok. Various letters went from office to office asking about him and the last information was that the sentence was remitted and he was posted 20.3.1919. Fleetwood transferred to Class Z army reserve on 15th July 1919. He went on to marry Beatrice Simms around 1922 and they had a son Denis Fleetwood who lived in Solihull Birmingham. Fleetwood died in Solihull in 1970. Frederick Bertie Dray, born 12/10/1896 -1953, Number 10091 The Buffs. Frederick was a greengrocer by trade living with his parents. He enlisted aged 18 years. 29.11.1913 at Shorncliffe, Folkestone, Kent and was discharged 16.1.1914 after serving 49 days. Stated on his discharge papers was: ‘unlikely to become an efficient soldier’. Apparently this type of discharge usually meant that he could not shoot straight or perform drill, (this probably saved him from getting killed in WW1.) Interestingly Frederick’s history sheet showed he had 3 elder brothers all in the 2nd Buffs stationed in Wellington, India, Madras. This procedure, of so many brothers in the same battalion, was later stopped in WW1 to prevent multiple family casualties in battle. George and Sophia had five sons; Henry 1897 – 1918, Albert 1888 – ?, Frederick 1893 - ?, Frank 1894 – 1969 and Richard 1899 – 1953. 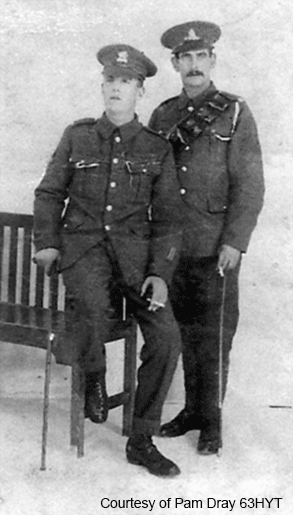 The two soldiers pictured below are Henry and Albert Dray. The picture was taken in 1917. On the left is Henry Dray, born in Saltwood, nr Hythe Kent 1897--2.7.1918. Henry Dray G/7618 East Kent Regiment The Buffs was 19 years old when he enlisted at Canterbury 13.5.1915. His service record stated he died of wounds, but also gave a lot of information regarding who his siblings, cousins and grandmother were. Next to Henry is his brother is Albert. Albert Dray was born 1888 in Saltwood, Kent. The only information I have about Albert is from his brother’s service record which states in 1919 Albert was in France. The information regarding the other brothers includes: Frederick born 1893. Fred was demobilised. Frank 1894 – 1969 was in H.M.S. in France and Richard 1899 – 1953 was in H.M.S. in Russia. John Dray 1860 - 1916 (Son of James Edward Dray and Elizabeth Cloake) and his wife Louisa Dray Nee Mills. John and Louisa Dray had 3 sons in the war; John 1885 - 1965, Charles 1886 – 1954 and Alfred 1892 – 1914. Private Alfred Horace Dray was 22 years old and was born and raised in Saltwood. He worked as a Gardner when he enlisted at Lichfield, Staffordshire. He had been in the 2nd Bge RFA but had a free discharge, Private 11842 2nd Battalion Durham Light Infantry. Alfred had been in France from 8th September 1914 till November 1914 where a Telegraph states he died on the Ambulance Ship “Asturias” on the 5th. 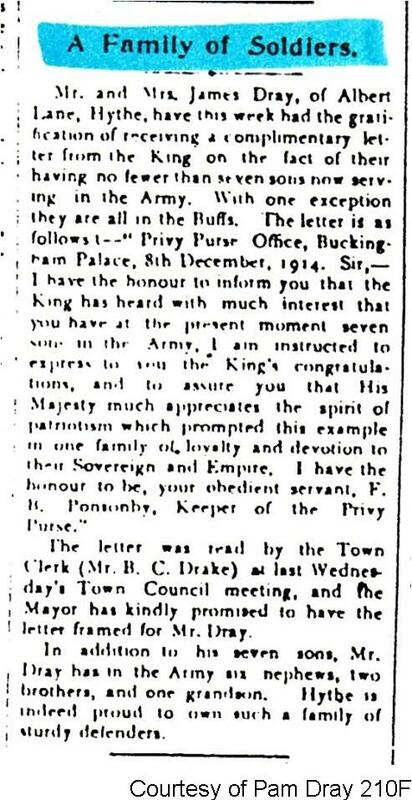 A letter dated 7th January 1914(but believed to be 1915) was written by Alfred’s father requesting to have his son’s Christmas gift from H.R.M Princess Mary. Alfred is buried at Netley Military Cemetery, Hampshire. Grave Ref: C.E. 1630. • John Dray, born in Saltwood, 1885-1965, stationed at the Gun Station in Folkestone. • Charles Thomas Dray, born Saltwood 1886-1954, was in the British Army in Germany. William Frederick Dray 1862 - August 1916 (Son of James Edward Dray and Elizabeth Cloake) and his wife Ellen Dray 1857-1922. William and Ellen Dray lived in Saltwood but moved at some such time to, 2, Warren Road, Folkestone. Sadly Ellen lost both her son and then her husband within 7 months of each other. Pte Christopher Cyril Dray L/10383 The Buffs, was born in Saltwood on the 31st August 1894. He was a baker by trade and eventually moved to 2, Warren Road, Folkestone with his family before signing up. Christopher died on the 15th March 1917 in France and at the time of his death, William and Ellen were living at 1, Avonshire Terrace, Horn Street, Nr Hythe, where they received a medal for their late son. William dies shortly after for reasons unknown. Sarah Elizabeth Dray 1869 - 1955 (Daughter of James Edward Dray and Elizabeth Cloake) and her husband John Rozier 1866 - 1944. Sarah was born in Saltwood and later married John Rozier. The couple lived in Islington and started a family. Their first child John Arthur Victor Rozier, born in 1891, enlisted and became 25229, 167th Coy. Machine Gun Corps (Infantry). Sadly John died on 8/3/1918 whilst serving in WW1. Edward Ronalds Cloke 1849 – 1923 (Step Son of James Edward Dray and Son of Elizabeth Cloake) and his wife Francis Sarah Ann Haywood. Edward Cloke, born in Saltwood, was the son of Elizabeth Cloake who married James Edward Dray and he took Edward on, making Edward Ronalds a brother to William, John, George and James. Leonard Edward Cloke who was born in 1884 and served as L/92328, L/Corp 2/East Kent Reg. Frank Cloke, born in 1896, serving as 62344 Gunner 91 H Battery R.G.A. Frank died in 1953. Albert Francis Cloke, born in 1901. Albert served as 47874 PTE 2/Lancs Fusrs but died of wounds in France in 1918 on the 3rd August. John and Sarah Dray were cousins to the Dray brothers mentioned previously. 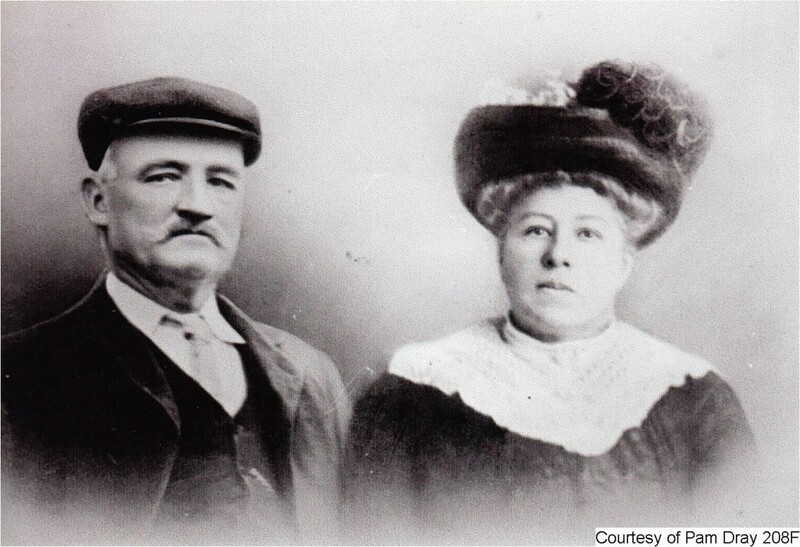 The couple were a farming family and had one son Edward 1881 – 1916.